I was late. I had badly underestimated how long it would take to walk. Distances always look at lot closer on maps. It was November yet it was incredibly hot and dry. I had walked along unfathomably long ‘boulevards’, devoid of anyone other people. After an hour and a half, and probably a gallon or two of sweat, I was greeted by a life-sized model of a Tyrannosaurus rex in combat with a Triceratops. 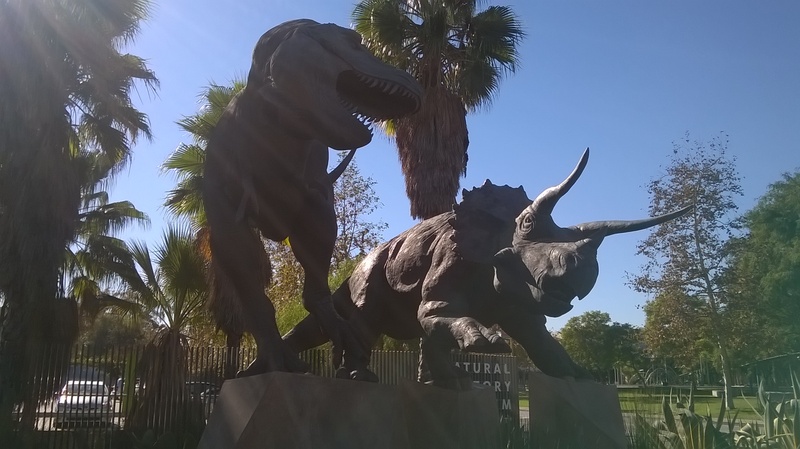 I had arrived at the Natural History Museum of Los Angeles. After seeing the amazing palaeontology collections with Sam Mcleod, I walked into Xiaoming Wang’s office. I’m on a research visit to find out how museums in America work with schools, and to find out how these museums are so much more successful at receiving donations than museums in the UK. I feel instantly at ease. Xiaoming’s kind, softly spoken manner emanates genuine interest and enthusiasm for what we were talking about, and conversation flows effortlessly. He moved the box around. Small white bone fragments caught the light. He looked up and smiled when I said I knew about bone-crushing dogs. These were a group of canids that broke away around 33 million years ago, and lived until just 1.8 million years ago across all of North America. 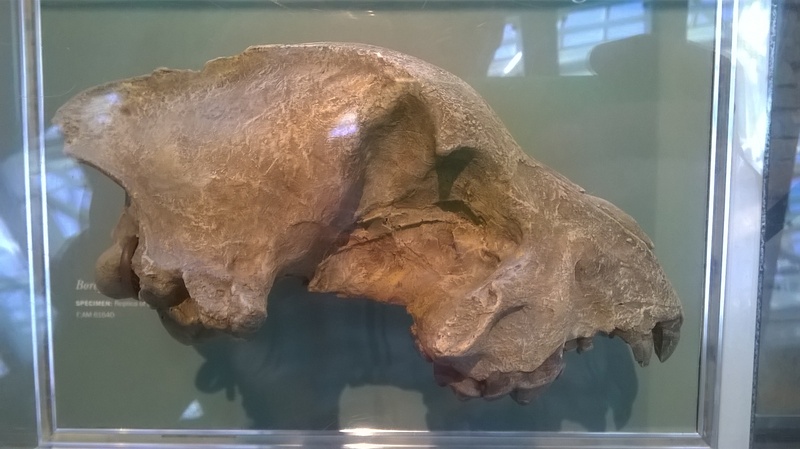 The group are known as bone-crushing dogs because it is thought they ate bone as well as meat based on the anatomy of the skull: a large crest on the top of the skull where a huge muscle would have attached giving it a bite with an enormous force; big strong teeth, similar to the modern spotted hyena. Xiaoming tells me excitedly that these are the first Borophagus coprolites ever found. It was difficult not to share his excitement. As two curators from two different continents, we both had a wonderful understanding of the importance of these few card trays. But I could not write about them just yet. Xiaoming and colleagues were writing an article about these unique fossils. And now the article is published, with a refreshingly simple title for a scientific paper: ‘First bone-cracking dog coprolites provide new insights into bone consumption in Borophagus and their unique ecological niche’. It turns out that you can get an awful lot of information from a few pieces of fossilised crap. 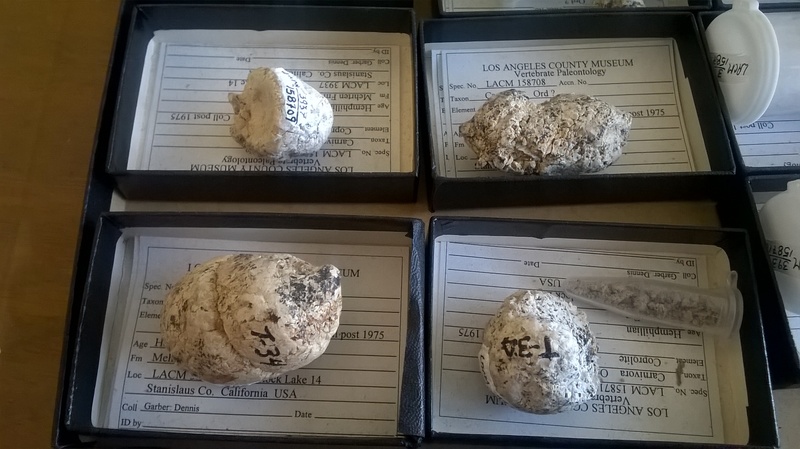 These 14 coprolites were found in 6 million year old sediments. You can see immediately that they were made by a carnivore: they are packed full of bone fragments. Fossils of several carnivores have also been found in this layer, including two species of Borophagus, an ancestral badger, an ancient species of wolverine and an old species of cat. Any of these carnivores could have made the poo, but because of the large size, and that the coprolites are jam-packed full of fragments of bone, it is more than likely that they were produced by Borophagus, more specifically, the commoner species that is found in this layer, B. parvus. And they are packed full of bones. Most of the bones are fragmentary and unidentifiable. But there are a few that hint at a previous animal: a bird bone; a beaver ramus; the rib of a large mammal; and the skull fragment of a medium mammal. This shows that these bones crushing dogs had a very varied diet and ate a large range of animals. Interestingly, these coprolites also show, that unlike the spotted hyenas (Crocuta crocuta) around today, they wouldn’t have crunched up an entire skeleton: the bone fragments in the coprolites were not completely dissolved indicating that the stomachs were not the same as spotted hyenas. One thing that surprised me, was that this was the first evidence of Borophagus poop ever found. 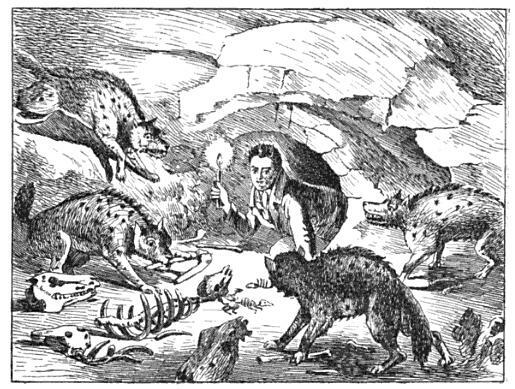 In England, and many sites in Europe, cave sites are full of hyena poop. I wondered whether the bone-crushing dogs were cave species too, or we they living out in the open. “As far as I know, there have never been cave borophagine dogs.” Xiaoming writes. “You are probably right that borophagine dogs are open pursuit predators that preferred open countries.” It also appears that there were less cave sites in North America than in Europe, because the States were drier compared to a more humid European climate producing more water to dissolve the limestone. As well as the diet, and a hint at the biology of this extinct animal, the coprolites also provide a fascinating glimpse into an ancient behaviour. With such a large concentration of coprolites found in this layer, it is possible that this was social defecating in Borophagus parvus. The coprolites would have formed clusters, just like hyenas and wolves today defecate mark territory. Hyenas and wolves are both highly social animals, and with Borophagus poop in such abundance in this layer, and in such a similar shape, it is more than likely that the bone-crushing dogs were social animals too. Although common in cave sites in Europe, hyena coprolites break down extremely fast out in the open. Rain water dissolves the coprolites to mush very quickly because of their high carbonate concentration (inside caves the poo is protected from the outside environment). For open country predators, like bone-crushing dogs, evidence of their poo would have been washed away quite quickly. And that makes these 14 ancient balls of poop extremely important. This entry was posted in Bone Crushing Dog and tagged Bone cu, Borophaginae, Borophagus, Coprolite, Crocuta crocuta, Natural History Museum of Los Angeles, Spotted Hyena. Bookmark the permalink. There is no such thing as a “cave species” of carnivore. The misnamed “cave lion” and “cave hyena” of the late Pleistocene rarely went inside caves. Most individuals of these species never entered a cave in their life. They are misnamed with the misleading adjective “cave” because that is where their remains are usually found. I love Tabitha’s Hyena art in the link (after you actually made my wonder about their poop!) and bone crushing dogs!